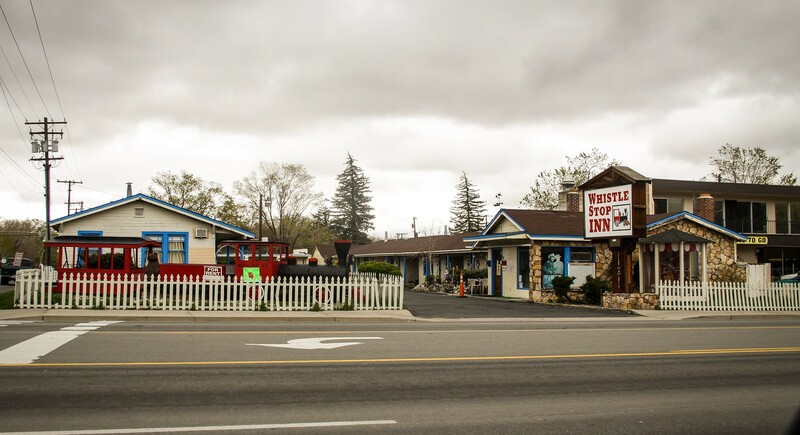 In the 1950s and 1960s, Carson Street was awash with sleepy, tree-lined motels. Especially north Carson Street, north of Hwy 50. Along this stretch there was a motel on nearly every block, most of them small, clean, and generally pleasant places. 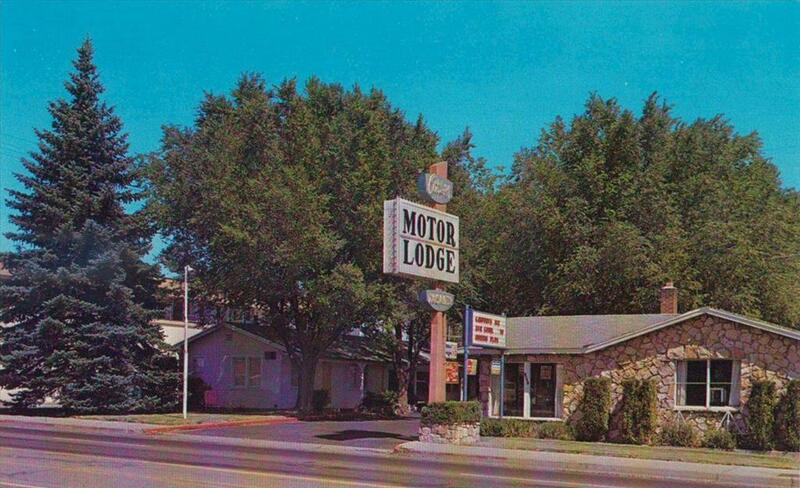 This was the golden age of the motel, after all, when a color TV and clean sheets could really set you apart from the fleabag hotels downtown, and being out in the suburbs of north Carson Street gave your establishment a rural feel while still being within walking distance of everything downtown. 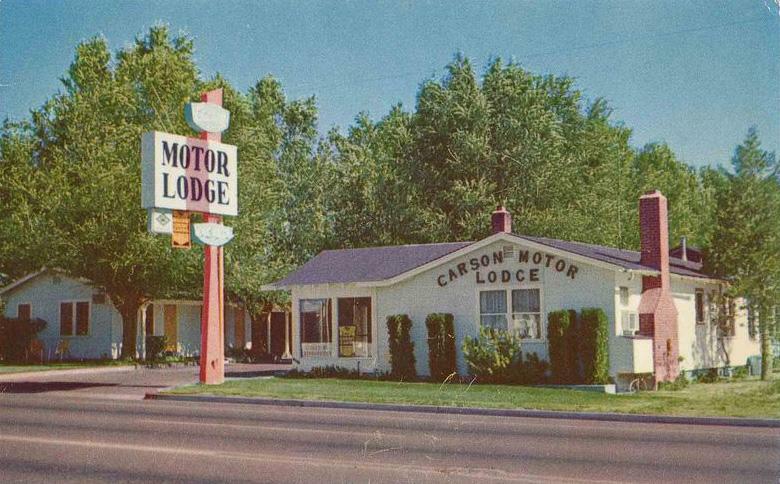 The Carson Motor Lodge was one of these places, at the corner of Carson and Adams. I don’t know much about what it was like back then, but it looks pleasant. Trimmed bushes, a mowed lawn, plenty of shade. A sign that’s not real flashy but that gets the job done. Even a couple of lawn chairs so you can sit down and watch the world go by. If you need a room for the night that looks like a good place. A few years later, and the place has gone through a bit of a remodel. Stone facing has been put on the front of the building, probably in an attempt to “modernize” it. Not much else has changed, though. It still looks like a decent place. The urbanization of this part of town is beginning, though. Across the street to the left you can see a 2-story office building that has sprung up. The limits of downtown are expanding, and where this motel used to be far enough away to be comfortable, maybe now it’s getting a little too crowded. A bit later on, and still not much has changed. The bushes are taller, the grass is less green. The sidewalk is looking a little cracked. It still looks like a decent place to stay, but maybe the sheets aren’t as clean as they used to be and there’s a musty smell in the air. Age is starting to take the motel, and though it happens slowly, it’s inevitable. Today, the age of quiet and clean motels along Carson Street is over. Many of the old motels are still around, though, remnants of the past. Land downtown was never valuable enough to buy up and demolish these old places, so they just kind of hung on. But just because they are still around doesn’t mean they’re in good shape. 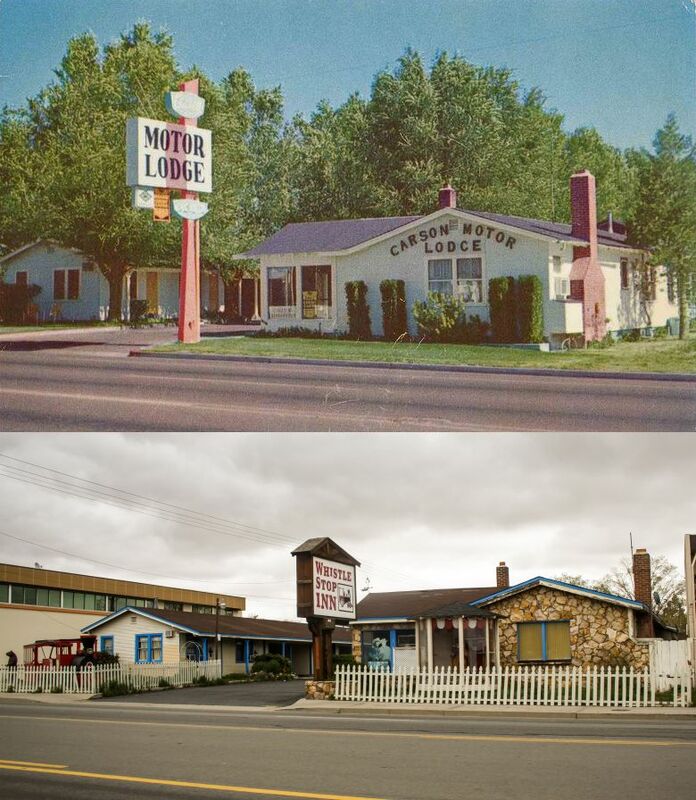 Time has not been kind to these motels. This part of town is firmly urbanized now. Old motels share their neighborhood with restaurants, gas stations, liquor stores, and thrift stores. Carson City’s commercial center shifted from downtown to north Carson Street with the construction of several shopping centers. Now this isn’t a bad part of town, but it isn’t the quiet neighborhood it used to be. And the Carson Motor Lodge isn’t what it used to be, either. It still stands, renamed the Whistle Stop Inn. The trees are gone, chopped down years ago. The grass is gone, replaced by rocks and a tattered picket fence. A train play set sits out front, a gazebo with a couple of mannequins has been added, and a sun-faded John Wayne watches you out the front window. The paint is peeling and the roof is worn. The place no longer looks crisp and comfortable, it now looks run down. And I don’t think it’s available for out of town travellers to stay here anymore. 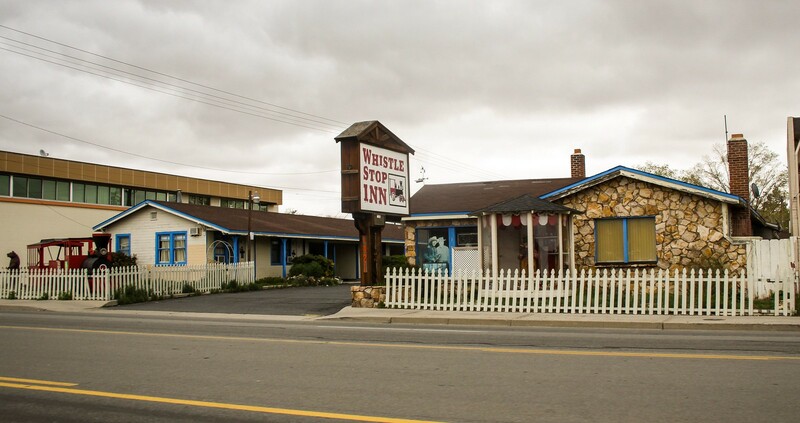 Like most of the old motels that are still standing in this part of town, the Whistle Stop Inn is used as low income housing for those who have trouble keeping an apartment. It is owned by Betty Brinson, a long-time daycare manager who also bought the troubled Downtowner Motor Inn on Washington Street. That motel has been a public eyesore and health hazard, and I’ve advocated many times for tearing it down. The Whistle Stop Inn is in better shape, and it looks like a good place for people who need it. The Whistle Stop Inn may no longer be in its prime. 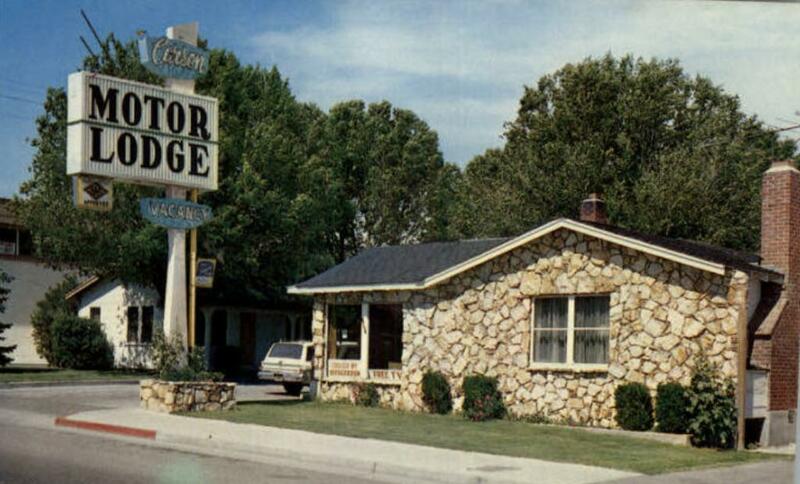 It has come a long way since the pristine motor lodge in the first pictures, and lost a lot of its charm. It’s still a vital part of Carson, though, and I expect it to be around for a long time still. Thanks to Jed Block for digging up the first two photos on this page.